Woven wood shades from Blinds Online (popularly known as bamboo shades) in roman fold style with valances are available in 31 different patterns and colors. Made from natural products, they may be made from grass, reeds, bamboo, rattan, jute and high quality wood. The sunlight peeks gently through the woven wood and gives you a semi-private view. 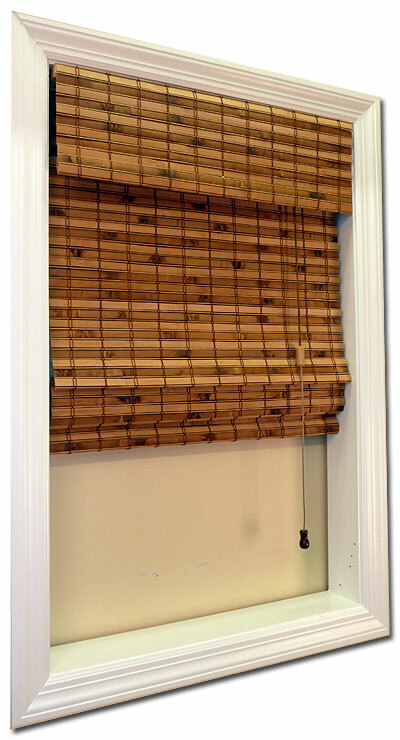 These bamboo shades come with the option of a blackout liner in order to increase your privacy and the amount of light that comes in your home or office. By buying your bamboo shades online, you can give your windows a lovely natural, earthy look and can be fitted to many different window sizes for a fraction of the price of other retailers. Bamboo shades online are one of our most popular sellers! Woven wood shades are great for keeping out the summer heat and the winter cold. 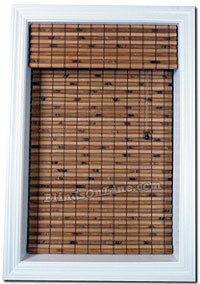 Many homeowners are now searching for bamboo blinds and shades to add to their home’s décor arrangements. Our team here at BlindsOnline.com thrives on offering the latest and most popular wood blinds and shades at wholesale pricing. And we’re now presenting our Woven Wood Shades at pricing levels far below our retail competitors! 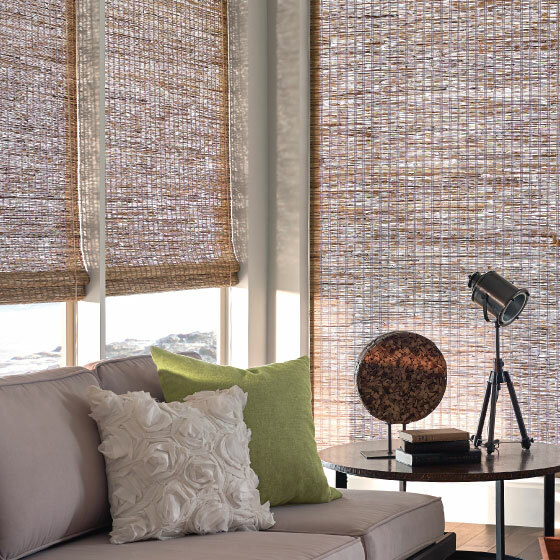 Each of our Woven Wood and Bamboo shades comes available in 25 unique patterns and colors, thereby providing each homeowner the optimal aesthetic qualities for their home space. Because we keep all of our bamboo shades online and in stock, we can send you color samples of any pattern or color you're looking for. There is a clear advantage when buying blinds online as opposed to paying big box store prices! Oftentimes, homeowners mistakenly purchase off-the-shelf shades from our competitors in the belief that they will offer the perfect fit for their home. But these products are often unevenly matched and don’t offer the requisite level of style or functionality. At BlindsOnline.com, we’re offering our woven wood and bamboo window shades in a range of custom sizing options to ensure that precise fit for all window spaces. Homeowners must be protected when they make an investment within the latest shades products. BlindsOnline.com is now offering a limited lifetime warranty on our bamboo shades and woven wooden shades. It’s a warranty that means each of our clients can protect their investment in the unlikely event they discover a problem with their shades. Woven wood shades are made from natural materials and can be affected by temperature and humidity which can stretch or shrink the material. This is considered normal and is not covered by the warranty. "I love my new blind"
"I am so pleased!! I am telling all of my family and friends about you! I purchased the Woven Wood Roman Fold with the Top down/Bottom up option and love them. They are BEAUFITUL. Mike sent me many samples to chose from. I searched all over and BlindsOnLine had the BEST price and the quality is exceptional. Thank you!" "I love these shades. We bought the galvez pattern with a wheat edge band for the powder room and they look great." "I used the Lorena Pine woven wood shade in my Florida room and it look great. The cool thing is that during the day I can see thru it a little when closed so I can keep an eye on the yard. Nice!" "I put these in my sunroom to cut down on the sun's heat and they look great!"